Greetings! The Blue Mage community is one of the most active job communities as of late, and of course this ends up leading to a lot of questions, many of which have answers already. To help combat this, and to help people that are new to the job, I bring you The Beast Within, a comprehensive guide to all things Blue Mage. It should leave very few questions unanswered, however if there is anything that I overlook, leave a post or send me a PM. II. What can I do as a Blue Mage? Employing the legendary arts of The Immortals, we are formidable fighter-mages who employ elegant and devastating swordplay for close combat, while decimating their enemies both close up and from afar with fell magic mastered from our opponents. Blue Mage is an enormously versatile job. We’re capable of dealing damage, taking damage, and even patching up our comrades if the need arises. Your success at these roles will come largely from both your equipment as well as your ability to utilize that equipment appropriately. Blue Mage is not a job for the faint of heart, as it requires a level of dedication and mastery that not many other jobs demand. To begin your journey as a Blue Mage, seek a man named Waoud in Aht Urghan Whitegate. [Level 1] Azure Lore (1:00:00) - For 30 seconds, causes all physical blue magic spells to act as if they are under the effects of 350TP (without consuming any of your actual TP). Some magical spells have their multiplier increased. Azure Lore will also allow all physical spells cast during its duration to skillchain as well as all magical spells to magic burst. Mirage Bazubands +2 enhance the duration of Azure Lore by 10 seconds. [Level 25] Burst Affinity (2:00) - Allows your next magical blue magic spell to magic burst. That is to say, without Burst Affinity, you can not magic burst your spells. The effect lasts for 30 seconds, or until you cast your next offensive magical blue magic spell. Aside from allowing your spell to magic burst, it will also enhance its damage by doubling its WSC modifiers. Mavi Basmak +1 and +2 enhance this further, the +1s offering an additional +5% WSC and the +2s offering an additional +10% WSC for a total of +105% and +110% WSC. Assimilator's Shalwar also enhance Burst Affinity, giving any magical damage spell cast while under its effect an additional 10 base damage for the NQ Shalwar or 12 base damage for the HQ Shalwar. [Level 40] Chain Affinity (2:00) - Allows your next physical blue magic spell to skillchain. Just like your magical spells, physical blue magic is incapable of skillchaining unless under the influence of Chain Affinity. You may use this to either skillchain off of one of your own weaponskills, someone else's weaponskill, or someone else's Chain Affinity-augmented physical blue magic spell. Chain Affinity further enhances the power of the spell as well by doubling its WSC modifiers. Mavi Kavuk +1 and +2 augment Chain Affinity further to introduce a base damage bonus of +10 for the +1 and +20 for the +2. Assimilator's Charuqs also enhance Chain Affinity by giving any physical damage spell cast while under its effect an additional 20 base damage. [Level 75(Merit)] Diffusion (10:00)- Causes the next supporting blue magic spell that you cast within 60 seconds to become AoE, affecting any members of your party that are within 9' of you. Each merit of Diffusion (after the first) increases the duration of buffs cast under its effects by 5%, for a total of +20% buff duration. Mirage Charuqs +2 further enhance Diffusion by adding an additional 5% buff duration per merit that you have into Diffusion. This leads to a total of +45% buff duration if you are 5/5 in Diffusion while wearing Mirage Charuqs +2. [Level 75(Merit)] Convergence (10:00) - Causes the next magical spell that you cast to be greatly enhanced, and if it's AoE it will be reduced to a single target. For every merit that you put into Convergence, you will enhance the initial +5% magic damage and +5 magic accuracy by an additional +5% magic damage and +5 magic accuracy, for a total of +25% magic damage and +25 magic accuracy. Mirage Keffiyeh +2 enhances Convergence further by increasing the magic damage bonus by 2% for each merit that you have into Convergence for a total of an additional +10% damage. It is also very likely that it adds an additional +2 magic accuracy per merit, however I've not tested it. [Level 83] Efflux (3:00) - This job ability will greatly enhance the next physical blue magic spell that you cast within 60 seconds. It adds the effect of 100TP to the spell (without consuming any of your actual TP) as well as multiplies the spell's base damage by 1.5. Mavi Tayt +1 and +2 further enhance the TP bonus of the spell to +125 and +150 respectively. [Level 95] Unbridled Learning (5:00) - Upon use, gives access to the following spells for up to 60 seconds, you may only cast one of them before the effect wears off: Thunderbolt, Harden Shell, Absolute Terror, Gates of Hades, Tourbillion, Pyric Bulwark, Bilgestorm, Bloodrake, Blistering Roar, Droning Whirlwind, Carcharian Verve, Uproot, Crashing Thunder, and Polar Roar. [Level 96] Unbridled Wisdom (1:00:00) - For 60 seconds, allows infinite access to Unbridled Learning spells and sets all of their recast times to 0. Also resets the timer of Unbridled Learning. Chain Affinity Recast - Reduces the recast time of Chain Affinity by 4 seconds per merit. Burst Affinity Recast - Reduces the recast time of Burst Affinity by 4 seconds per merit. Physical Potency - Increases the accuracy of physical blue magic spells by 2 per merit and physical blue magic attack by 4/256 per merit. Magical Accuracy - Increases the accuracy of magical blue magic spells by 2 per merit. Monster Correlation - Increases the potency of positive monster correlation by 1. Convergence - Unlocks Convergence and increases its effects with each additional merit. Diffusion - Unlocks Diffusion and increases the duration of buffs cast while under its influence by 5% per merit. Enchainment - Adds a TP bonus to spells cast while under the effects of Chain Affinity, +10TP per merit. 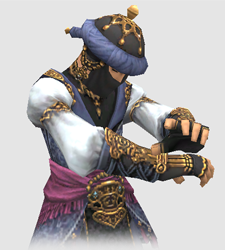 This is enhanced further by Mirage Jubbah +2, which adds an additional +5TP per merit. Assimilation - Increases your available blue magic set points by 1 per merit. This is enhanced by Mirage Shalwar +2, adding +3% Magic Critial Hit rate per merit. In most circumstances, you'll want 5/5 Physical Potency and 5/5 Magical Accuracy for group 1 merits, while putting 5/5 Assimilation and 5/5 in Diffusion for group two. One merit into Convergence may have situational value, particularly in reducing one of BLU's many AoE spells to a single target. However, the long recast time limits the utility of this option as well as its impact on damage output. Given the various buffs that BLU can extend to the rest of one's party via Diffusion, as well as the duration bonus that further merits provide, it is generally the better option. Burst Affinity merits may likewise warrant consideration for nuking-oriented situations, but BLU's dependence on a 1:40~2:00 cooldown to magic burst limits our ability to contribute in such situations. Feel free to manipulate one's merits as needed given the current ease in obtaining merit points. Job Trait Bonus Increases job traits gained from equipped blue magic by 1. ★Master! Grants the designation "Master Magus." Job Trait Bonus Increases job traits gained from equipped blue magic by 2. Does not affect Gilfinder, Double Attack, or Auto Refresh. Blue Magic Effect Attributes that affect the potency of blue magic spells are considered to be 5% higher when casting blue magic spells. Reasoning: Our absolute best WSD body, huge blue magic skill, and a good +3 refresh body. Reasoning: Great blue magic skill for buffs and a nice +2 refresh body. Reasoning: The hands are a superb accuracy + DT option. The head is our best pure magic accuracy option when counting in the set bonus. The legs are a fantastic magic accuracy piece as well as a very powerful nuking option. Feet are our best physical spell option and also boast very high accuracy for when you find yourself starved of it. Reasoning: If you’re learning new spells, these may help to cut down on the grind. Other than spell-hunting, they serve no real purpose. Reasoning: Everything serves a purpose depending on how you play the job. Reasoning: For the keffiyeh, we have far better nuking options and the monster correlation effects is just SE making fun of us. Legs, while they have the boost to Burst Affinity, lack any native MAB and are far worse than other options. Feet have the Chain Affinity bonus, but more current gear can beat the damage boost through raw stats alone. Reasoning: An extremely powerful nuking, physical WS, and elemental WS option all rolled into one. Reasoning: The boost to Diffusion is absolutely necessary for keeping maximum uptime on your group buffs, namely Mighty Guard. They also come with a decent amount of skill for skill-dependent buffs. If you are looking solely for the Diffusion boost, you only need to get the Relic +2 version augmented through the Trials of the Magians or obtain the 109 version. Reasoning: Both options provide a small increase in blue magic skill. Personally, I do not recommend making these at all, especially given that the Diffusion augment does not increase. However, if you really want the skill, you can get it here. Reasoning: The hands have an augment that increases Azure Lore duration by 10 seconds, but you again only need the augmented Relic +2 or 109 version. The body has a decent amount of accuracy if you’re starting out, while also being a very respectable Fast Cast option. The head is nice for skill-dependent buffs and in the very off-chance you use breath spells. Reasoning: AF+3 body already supplies our refresh and high accuracy needs, while Taeon Tabard can get the same Fast Cast value. AF+3 hands offer far more over these with their high accuracy and DT combination. An argument can be made for these pieces for Requiescat due to their high attack, but Requiescat is horrible and is not worth gearing for. Reasoning: We have far better nuking leg options. Reasoning: Very good nuking feet with a large amount of magic accuracy. The boost to Burst Affinity damage is exceptional, as well. The legs offer the second-highest amount of blue magic skill on any piece of gear in the game, losing only to path D Iris. The Efflux bonus is also good, but will eventually fall short of better gear. Reasoning: The hands have an exceptional –recast for your longer cooldown buffs, such as Barrier Tusk and Diamondhide. You will eventually cap your Fast Cast, but until then, the body is a huge help for casting blue magic. The head offers a good amount of accuracy and a decent boost to Chain Affinity, although you will eventually be able to pass it by with other gear. Section II - What can I do as a Blue Mage? Blue Mage has plenty of tools at its disposal for dishing out punishment. Not only are we adept at using one handed swords, we also have access to a wide array of both magical and physical damage spells that allow us to adjust the type of damage that we do to fit our needs. Most of the time, you’ll be looking at dealing physical damage, and your swords will be the primary source of damage while your physical blue magic supplements them. Physical magic has seen some significant improvements since Seekers of Adoulin launched, including large base damage and blue magic attack buffs via sword skill and attack score on your main handed weapon, which has made it much more viable to use in combat against even the strongest targets, albeit in moderation. Every time you cast a spell, you impose a 2 second delay on yourself in addition to the casting time of the spell. This adds up quickly, making spell spamming a less profitable venture than it may seem. That said, tossing out a strong spell like Sinker Drill or Thrashing Assault every weaponskill or two, especially in conjunction with Chain Affinity or Efflux, should be a net damage gain in most cases. Chant du Cygne is your best sword weaponskill, while Realmrazer is your best one for Club (more on this later). Requiescat should only be used if the target resists physical or slashing damage during a certain phase or with a certain buff up (Invincible for example). Never use it as your primary weaponskill. Sanguine Blade and Flash nova are also strong options if you have good enough Magic Attack Bonus equipment, and they are the strongest you have access to if you have a Geomancer providing MAB+ and MDEF- bubbles. The general idea of dealing physical damage with blue mage centers around three major facets: our wide array of powerful offensive traits, our utilitarian stock of support tools, and our ability to be able to deal decent burst damage even without having TP. In most circumstances, you'll want to pile on as many strong DD traits as you can while maintaining your powerful supports spells including Winds of Promyvion, White Wind, Nature's Meditation and Cocoon. Traits will include other useful spells already (Sudden Lunge for Store TP for example). This will affect your ability to deal damage significantly, turning BLU into one of the best sources of damage from the one handed camp, and indeed, even the two handed one. Keeping up Nature's Meditation as often as possible is going to be more of an advantage for you than a disadvantage, especially if you have a high amount of fast cast to soften the blow of casting times. Additionally, keeping up a defense down such as Bilgestorm or Tenebral Crush if your alliance does not have something like Angon or if Angon is down can be a major asset to the damage output of your entire team. BLU is in a rather unique position in this way: while you're capable of dishing out high levels of damage, you're also more than capable of supporting your entire team with heals and debuffs at the same time, something that almost any other DD job cannot say that they can do. Never ignore the support aspect, but do use it in moderation; you're there primarily as a DD if you have a strong backline already. If you are running lowman with few support classes to back up the party, leaning on your support spells a little more could be advisable. For the few exceptions wherein physical damage will be severely blunted, you’ll want to switch to primarily magical damage. Sanguine Blade or Flash Nova will be your go-to here, they won't be matched for single target magic damage by any of your spells. If you want, you can supplement them with Retinal Glare for the additional mitigation provided by its Flash effect, but it will more than likely be a DPS loss for you. Blue Mage does have a decent variety of magical spells at its disposal however... if you for some reason can't be within melee range. Magical spells have seen massive improvements as of late, with our recent elemental spells being colossally powerful and also applying potent debuffs. These spells have similar stopping power to high-level Ga or Ja spells for a fraction of the cost. In addition to that, our AoE damage is NOT reduced based on how many targets we hit, making BLU the strongest source of AoE magic damage in the game (more on this later). Not only do our new spells pack a massive punch, our old ones have unique features. For example, Regurgitation and Corrosive Ooze generate the absolute minimum possible amount of enmity per cast regardless of damage done. This makes it the most enmity efficient damage dealing action in the game, and with the recent addition of the magic damage+ stat, they've become even more efficient due to their fairly low fTP and WSCs being supplemented by straight base damage boosts in addition to low casting and recast times. Rail Cannon, Everyone's Grudge, and Dark Orb are also strong candidates for nuking while Retinal Glare is a fast, cheap way to not only deal magical damage, but also provide a fairly potent mitigation effect in the form of a nearly 100% uptime Flash effect. Blue Mage also possesses the strongest and most efficient AoE magic damage available in the game. Subduction alone is capable of putting out 7k+ damage per cast at a nearly instant recast. Tempestuous Upheaval and Embalming Earth are also valuable for this role, albeit not nearly as efficient. Charged Whisker also remains a strong option. It's also very much worth mentioning the power of Diffusion. With your +1 Luhlaza Charuqs and full merits/JPs, you can provide some very strong, fairly long lasting buffs to your party for little to no cost to you as the added duration on the buffs will pay for the additional cost of JA delay. Mighty Guard is our best bet in basically any situation, but don’t forget things like Nat. Meditation, Erratic Flutter, and Carcharian Verve. We also have other options like Harden Shell, which provides a sizeable (40% or more) resistance to physical damage against most targets for a good amount of time. In the same vein, Barrier Tusk provides a static 15% damage reduction that stacks multiplicative with existing DT- and, with the buff duration adjustments, lasts a fair amount of time. Tanking is back and it has returned with a vengeance. Unfortunately, PLD and RUN are the only two jobs sought after for this position. Admittedly, the job was never acknowledged very widely as a capable tank, however that was to the detriment of those who ignored its potential. BLU boasts the single highest enmity output potential of any job in the game, having multiple spells capable of generating large amounts of enmity in rapid succession, most of which not even requiring the user to be engaged to the target. Fantod, for example, casts extremely quickly and generates 320 Cumulative and Volatile enmity with the ability to be recast every few seconds. Poison Breath, and its new more efficient cousin Wind Breath, used to be the most efficient enmity generating tools in the game, dealing a bit of damage and giving a sizeable chunk of enmity to the user. In combination with other spells (like Jettatura, which produces 180 cumulative and 1020 volatile enmity), you could theoretically maintain a target's attention without even engaging it. Key word "theoretically"; due to FFXI's enmity system, this function is next to completely worthless in today's metagame, and besides that, you'd be hard pressed to find a fight in which engaging and dealing damage while also holding the monster's attention is less effective than holding back due to fear of TP spam. In addition to its immense enmity generating capabilities, BLU also possesses a well above average degree of defensive tools. Cocoon is among the best physical mitigation tools in the game, despite being often discounted as not very effective (pending player defense ratio changes, it may be elevated even further up the totem pole). Keeping Cocoon active will increase your lifespan significantly over time for very little cost, especially with a well-built fast cast set. In nearly the same vein, Magic Barrier serves as a major magic damage mitigation tool, capable of absorbing 500~ magic damage depending on your blue magic skill. Other defensive tools also exist, such as Sudden Lunge, Occultation, and Saline Coat, each capable of reducing the damage you take (and in Sudden Lunge's case, the damage that your entire team takes) significantly. Knowing how and when to use these tools is important, even outside of a tanking role, and it's fortunately very easy to see where they all fit in. If you're taking a lot of single target or AoE physical damage, stick on Cocoon. If the target's method of damage is primarily single target, then Occultation will provide a huge amount of damage mitigation. Magic Barrier and Saline Coat can be used to soak up large quantities of magical damage, while Sudden Lunge is an absolute beast of a spell that entirely shuts down a target for several seconds as long as they don't resist (this spell applies to basically any situation). So while tanking is exceptionally important at the moment, BLU continues to be passed over for this role. However, the future is bright. With JTB2 and our new traits, we officially have some of the absolute best defenses in the game. Spread the word about the strength of BLU tanking, and we might just start seeing shouts for BLU tanks. Learning how to properly control your defensive and tanking tools could be a very beneficial practice. This one, like tanking, has always went largely unnoticed, and just like tanking, has fallen by the wayside. White Mages and Scholars have overtaken BLU quite significantly in the healing department with the recent changes to Cure spells as well as other adjustments such as new Job Abilities and spells being added for each job. BLU's remained effectively stagnant in the category, having still only Wild Carrot, Magic Fruit, and Plenilune Embrace as noteworthy healing spells and only a couple new spells that support the idea of healing a group. While this wasn't an issue prior to the cure buff (Magic Fruit was easily the most efficient high effectiveness cure in the game), Blue Magic does not benefit from the healing magic skill adjustments, therefor any other healer will easily outpace BLU in terms of heal efficiency cure for cure, and will leave it in the dust over large amounts of time. White Wind, Winds of Promyvion, and to a lesser extent spells like Magic Barrier (in conjunction with the Diffusion adjustments that allow for a 10 minute recast timer with only 1 merit invested) have been beneficial to this role, however they simply are not enough. While White Wind is an amazing AoE cure spell, it's also very expensive; because of this, extended use is prohibited by BLU's relatively small MP pool and lack of very many natural MP efficiency tools. So while you can certainly don /SCH and go heal a small group on moderately leveled content, healing a larger group is best left to a specialized healer in today's FFXI. Don't discount the role completely, but do not expect it to be something that you're specifically going to be asked to do at pretty much any time. Proccing is the bane of Blue Mage's existence. In its first incarnation in Abyssea, it was next to unbearable in some cases with spells like Blitzhrahl and 1000 Needles being required on certain Vana'Diel days. This was alleviated to a large degree in a version update which cut the number of Blue Magic proc spells in half, allowing much more leniency in our ability to set useful things and removing notorious problem spells like the aforementioned 1000 Needles. However, things got worse after that. Voidwatch instituted a new, even broader proc system. At its inception, you had no way of knowing which specific school of magic that the enemy was weak to, and we had only a rudimentary list of proc spells available. As such, Blue Mage was effectively entirely limited to setting elemental spells out the wazoo, some of which being heavily resisted thus providing severe problems in terms of ability to proc with them. Once again this was partially alleviated over time as our understanding of the Voidwatch proc system ripened and we developed comprehensive lists of proc spells. SE also did their part by implementing Atmacites that allowed the holder to see exact proc specifications, including element and type, i.e. Water Blue Magic rather than just water magic. The issue has yet to be completely alleviated however; Blue Mage still has an immense amount of proc spells that it has to take care of, so many that it is physically impossible to set them all at once. Fortunately, there's ways around this. Generally speaking, unless you're in a poor Voidwatch group, you need only worry about High and Extreme vulnerabilities. You also need only set two or three elements at a time, allowing you to maintain at minimum Dual Wield II, Store TP, and Frightful Roar. The efficiency of subbing WAR and setting only a few elements at a time in addition to DD traits and support spells greatly oversteps subbing BLM and setting only proc spells over time. So while the shackles still exist, they aren't as tight as they could be. No job in the game currently has the same level of AoE magic damage as a Blue Mage. With proper magic sets, a BLU can single-handedly wipe out an army of enemies. This style of grinding has become even more popular as of late, owing to our colossally powerful new spells and the large amount of job points needed for BLU. The general premise behind this form of combat is simple. Your job is to gather as many enemies as possible and blow them to smithereens. The actual mechanics of this are sometimes more complex, however. More often than not, you will be solo cleaving, meaning that you will be the primary puller, healer, and killer. Luckily, you’re playing the most versatile job in the game, and can fill each of those roles with aplomb. For solo situations, you will want to set a good mix of AoE magic damage spells that correlate to the element(s) that your targets are weak to, defensive spells/traits, and a reliable source of healing and MP generation. Exact spellsets are discussed in greater detail in the spellset section. Step 1: Buff yourself with all of the defensive abilities you have chosen for yourself. A particularly important spell to keep active is Carcharian Verve, as the aquaveil effect from this spell is huge in being able to complete your casting while being smacked by multiple enemies. Step 2: Gather the mobs. Step 3: Make sure you’ll hit them all with your nukes, and start going to town. Particularly effective spells to be using for damage are those that also apply negative debuffs on enemies, such as the petrify from Entomb, terror from Spectral Floe, or massive gravity from Subduction. Step 4: Recover from your pull while silently judging the poor souls unable to visit such swift destruction upon their foes. Step 5: Rinse and repeat until you have your 2100 JP gift and you never want to cleave again. In party situations, your role may change. If you have a dedicated gatherer, your job is to kill things and keep your puller alive. The same powerful spells will be used, but there will be a much smaller danger to you personally, and you can instead focus on simply dealing damage. This setup becomes particularly effective when multiple Blue Mages get together, as the speed at which enemies are dispatched greatly increases. Altogether, this style of grinding is very simple once you get the hang of it, but it will require suitable gear. Blue Mage has access to a staggering array of spells that fill many different utilities, from damage, to enfeebles, to healing spells, to defensive buffs; we have a spell that can do just about anything that you would ever want to do. While we’re limited in how many of these spells that we can use at any given time, we can put together spell sets that fit the situations we’re in and optimize our potential however we may need to. In this section, I’ll give an in-depth list of spells as well as a list of spell sets that you will be using the most. Experimentation is encouraged, but keep in mind that diverging too far from the general structure of these spell sets will likely see a decrease in performance, so before you remove a job trait or a buff spell, make sure to see why they’re included in the spell set. 99MP. You are only able to cast this spell while under the effects of Unbridled Learning. MP Drainkiss – Variable MP drain (Similar to Aspir) Cannot affect undead or enemies without MP. Self-Destruct – Go boom. AoE damage based on HP at the time of casting. 1000 Needles Deals 1000 damage split evenly among nearby enemies. 224MP. You are only able to cast this spell while under the effects of Unbridled Learning. 88MP. You are only able to cast this spell while under the effects of Unbridled Learning. 172MP. You are only able to cast this spell while under the effects of Unbridled Learning. 126MP. You are only able to cast this spell while under the effects of Unbridled Learning. Reaving Wind – Reduce TP of all enemies in range by 1000. Amount reduced does not depend on the monster's current TP, save that TP values cannot go below 0. 29MP. You are only able to cast this spell while under the effects of Unbridled Learning. 43MP. You are only able to cast this spell while under the effects of Unbridled Learning. Pollen – Restores HP to only the caster. Roughly the same as the healing magic spell Cure, MND being the most effective modifier while VIT is a less effective secondary modifier. It is affected by cure potency. Soft caps at 36HP healed. Metallic Body – Applies a stoneskin effect that absorbs damage equal to skill*0.375 + 12.5. Caps at 200 damage absorbed (500 skill). Cocoon – Applies a 50% defense bonus. Healing Breeze – Restores HP to the caster and all party members within 10’. Roughly the same as the healing magic spells Curaga and Curaga II, MND being the most effective modifier while VIT is a less effective secondary modifier. It is affected by cure potency. Soft caps at 180HP healed. Wild Carrot – Restores HP to a party member. Roughly the same as cure III. MND is the most effective modifier while VIT is a less effective secondary modifier. Affected by cure potency. Soft cap at 180 HP. Refueling – Applies a 10% magical haste effect. Feather Barrier – Applies a buff of +20 evasion. Magic Fruit – Restores HP to the caster or target party member. It is roughly equivalent to the healing magic spells Cure IV and Cure V, MND being the most effective modifier while VIT is a less effective secondary modifier where 1 MND = 1.5HP and 1 VIT = 0.5 HP, it is also affected by healing magic skill and cure potency. Soft caps at 550 HP healed, hard caps at 610 HP. Not affected by day/weather effects. Memento Mori – Applies a buff of +20 magic attack bonus. Voracious Trunk – Steals one beneficial effect from an enemy. Zephyr Mantle – Applies a blink effect that absorbs a maximum of 4 attacks. Diamondhide – Applies a stoneskin effect to the caster and all party members within 10’ that absorbs damage equal to skill*0.6 + 20. Caps at 320 damage absorbed (500 skill). Warm-Up – Applies a buff of +10 accuracy and +10 evasion. Amplification – Applies a buff of +10 magic attack bonus and +10 magic defense bonus. Triumphant Roar – Applies a buff of +15% attack (38/256). Saline Coat – Applies a buff of +50 magic defense bonus that decays over time to a minimum potency of +8 magic defense bonus. 50 -> 37 -> 27 -> 20 -> 15 -> 11 -> 8. Reactor Cool – Applies and ice spikes effect as well as a buff of +12% defense. Exuviation – Restores approximately 80 HP and removes a single status ailment that could normally be removes by the healing magic spell Erase. Plenilune Embrace - Restores HP to the caster or target party member as well as bestowing a buff of 1%~15% attack and 1~15 magic attack bonus depending on the moon phase. It is roughly equivalent to the healing magic spells Cure IV and Cure V, MND being the most effective modifier while VIT is a less effective secondary modifier where 1 MND = 1.5HP and 1 VIT = 0.5 HP, it is also affected by healing magic skill and cure potency, its HP healed being identical to the amount of HP healed by Magic Fruit +100 (+1 extra per every 1% of cure potency). Soft caps at 650 HP healed, hard caps at 710 HP. Regeneration – Applies a regen effect of 10HP/tic. Restores a total of 300HP by the end of its duration. Animating Wail – Applies a 15% magical haste buff. Battery Charge – Applies a refresh effect of 3MP/tic. Restores a net total of 250MP by the end of its duration. Magic Barrier – Applies a magic shield that absorbs magic damage equal to your current blue magic skill. Fantod – Applies a boost effect that enhances your attack by 2.7%~29.7% and your magic attack by 2~20. Stacks up to 10 times, each stack increasing the buff exponentially. Occultation – Applies a blink effect that absorbs attacks based on your blue magic skill. Every 50 skill = 1 shadow. Winds of Promyvion – Removes one detrimental status effect from the caster and party members within 10’. Will only remove status effects that can be removed by the healing magic spell Erase. Barrier Tusk – Applies a Phalanx effect that reduces damage by 15%. This damage reduction is multiplicative and passes the 50% damage reduction cap, maxing your damage reduction out at 57.5%. White Wind - Restores HP to the caster and all party members within 10’. HP healed is equal to floor(MaxHP/7)*2 and is affected by cure potency. Orcish Counterstance – Applies a buff of +10% counter rate and increases the damage of counterattacks by 50%. Harden Shell – Applies a 100% defense bonus. Pyric Bulwark – Applies a physical shield that absorbs the next physical attack directed at you. Nature's Meditation - Applies a buff of +20% attack (52/256). 65MP. You are only able to cast this spell while under the effects of Unbridled Learning. Erratic Flutter - Applies a 30% (307/1024) magical haste buff. Restoral - Restores HP to the caster. Affected by MND, VIT, and blue magic skill. Maximum 1040 HP healed. Mighty Guard – Grants the caster 15% magic haste, 15% defense, 15 MDB, and 30 regen/tick. Only usable while under the effects of Unbridled Learning. Now you may be asking yourself, "how does one make use of these awesome spells?" Well I have an answer for you. Below are a few templates for spell sets that you'll use in most situations. These are not do or die configurations in the slightest, in fact I strongly encourage you to adjust them to fit your individual needs based on the situation. This set provides you with all of the DD traits you'll need to deal the most damage that you can while leaving open some points for utility. You could set Frightful Roar, Magic Fruit, Cocoon, or other such spells to bolster your defensive and offensive support abilities with as little as one job point spent. This is an improved version of the standard DD spec. It adds an additional accuracy bonus trait and numerous utility spells while retaining Dual Wield III, Triple Attack, and Store TP. If the extra accuracy is unnecessary, you can remove Vanity Dive and Frenetic Rip for spells like Barrier Tusk, Whirl of Rage, and Dream Flower for additional utility and HP or Battery Charge if you feel that MP will become an issue. With maximum Job Points into blue magic set points and the level 100 Gift, this spell set ends up giving you Dual Wield IV, Triple Attack, Store TP III, Accuracy Bonus II, Critical Attack Bonus II, Skillchain Bonus II and other minor traits. Needless to say, a veritable bevy of powerful traits that indirectly affect gearing. With ideal gear, this is the best spellset for out and out DDing until you get your second job trait bonus. This set will give you a colossal amount of stopping power. Dual Wield III, Store TP V, Skillchain Bonus III, Critical Attack Bonus III, Triple Attack, and Accuracy Bonus IV are your primary DD traits. The set also gives you a powerful buff in the form of Nature’s Meditation and an excellent defense down with Tenebral Crush. This set itself only costs 78 points, so you will have 2 set points remaining to do with as you wish. One of these slots always goes to Cocoon for myself. Take into consideration that this set is very lacking in utility. My personal suggestion, in situations where you are required to be more versatile, would be to drop Anvil Lightning in favor of more defensive spells, such as Barrier Tusk, White Wind, Saline Coat or Winds of Promyvion. Don't forget that you can remove tiers from other traits in order to fit the set to the needs of each individual event. With properly optimized gear, this set is the absolute best you can use for physical damage. Provides Treasure Hunter, buffs, a moderate amount of AoE damage, and a bevy of offensive traits to facilitate efficient Dynamis farming. Do not fear for the lack of healing spells, Sanguine Blade is particularly effective in Dynamis and is the primary tool used for healing if it ever becomes necessary. If you have some job points, you can add and change around additional spells to this set to increase your effectiveness even further. For example, Thrashing Assault to bump DA up to TA, or Benthic Typhoon/Subduction for more AoE damage (and in the case of Subduction, stronger Sanguine Blades). This set is designed specifically for cleaving. It allows you to deal with any scenario that requires AoE damage while preserving yourself and offering a wide array of defensive benefit. Add or remove elemental nukes depending on what your targets are weak to. With job points, you can add additional spells to this set to increase single target damage or survivability. With Chain Affinity, you can easily create self skillchains to enhance your damage. Here are the better ones that you should be looking to use whenever you're attempting a skillchain. *Can result in a double Light/Darkness. Blue Mage only gets two permanent native job traits, and both of those come from merits. All of the other job traits that you receive naturally will come from different combinations of spells that you have set. No Blue Mage job traits gained through setting spells can stack with sub job traits, but they will overwrite sub job traits if stronger. The following is a list of these job traits and what spells you need in order to obtain them. Every tier of each trait requires 8 points to attain. Traits without a value given for higher than the first tier cannot be upgraded past tier I. A NOTE ON TRAITS: If you have spent 100 Job Points on BLU, you have unlocked a Job Point Gift that increases the level of all of your set traits by 1 (besides Double Attack, Triple Attack, Gilfinder, Treasure Hunter, and Auto Refresh). You receive a second Gift at 1200 Job Points that replicates this effect, enhancing the effect of any eligible traits by an additional tier, meaning that you will always have at least tier three (if it goes that high) of any given trait. These bonuses are exceptionally powerful. To put it into perspective, the 1200 gift allows you to obtain DWIII with only 4 set points, Attack Bonus 3 with only 5, Accuracy Bonus 3 with only 5, and Store TP 3 with only 5. The list goes on and on. Not only do these gifts open new doors in terms of damage output, they will also allow you to set more utility spells as well. These gifts allow you to play Blue Mage at the peak of its performance, and I highly recommend working on attaining them if you want the most from the job. Let's talk about Dual Wield for a little bit. When it comes to Dual Wield, a lot of people believe that the more the merrier and you should shove it into everywhere it can fit. In some situations, that's actually quite true, but in many, it's completely wrong. Keep in mind that Dual Wield lowers your TP/hit. We are only able to hit 80% delay reduction, and Dual Wield plays a factor in calculating delay. However, as soon as you hit that delay reduction cap, you can't attack any faster. Yet, if you have more DW than is necessary to hit that cap, you continue to lose TP/hit without gaining any attack speed. That's why it is incredibly important to understand Dual Wield calculations. So, let's actually calculate our delay. In order to properly calculate delay, you'll need to know the values of your outside haste sources. So, now that we know the types and values of haste in the game, let's figure out our delay. Let's look at a situation in which we have zero magical haste, capped gear haste, and Dual Wield 5 trait without any DW on gear. 256/1024 + 35% Dual Wield. Those are our values right now. With our Dual Wield value, we subtract the % of dual wield from 1. This looks like (1-.35), which leaves us with .65. For our gear haste, we take the value we have and subtract it from 1024. This looks like 1024-256, which gives us 768. We then take those two values and multiply them together. This looks like 768 x .65, which gives us 499.2. However, because of SE's flooring during calculations, this is floored to 499. Then divide this new value by 1024. So, 499/1024 = 0.487, or 48.7% delay remaining, with a delay reduction of 51.3%. This means that, in order to cap delay reduction, we need to reduce an additional 28.7%. Let’s try a new example. This time, we have Erratic Flutter (Haste 2, or 30% magical haste), capped gear haste, Dual Wield 5 and 10% additional DW from gear. Now we have 256/1024 + 300/1024 +45% DW. 257/1024 = .251, or 25.1% delay remaining, with 74.9% delay reduction. When it comes to delay reduction, you want to get as close to capping as you can without going over and without sacrificing large amounts of beneficial stats. "But guys, what spells do I really need? ", I hear you ask, desperate to embrace your power. Well, fledgling Immortal, here is a handy-dandy list from Prothescar himself of our most important spells. Important note about spells: Obviously, BLU has a massive array of spells. Not every single one will serve a purpose. Some are so far in the past that the only reason you'd ever want them would be for completion's sake. You don't need to get every single spell we have. However, do not discount spells that are not 90+. Some of our absolute best spells are from lower levels and provide massive benefit to us, either in the form of utility, defenses, or powerful traits. My most sincere suggestion is to look into each and every single spell and see what it does, how many set points it costs, and what trait it gives and decide whether or not you find it worthwhile. The greatest strength of Blue Mage is our ability to adapt to any and every situation in the game. By avoiding some spells, you limit that ability and hinder your performance. Blue Mage is a complex job that has many different spells that assume many different functions and roles. In order to support these spells, as well as your regular functions, you will require a large amount of gearsets. This is a very gear intensive job, and while some corners can be cut, every piece of gear that you remove will decrease your effectiveness, and that adds up. In this section, I will list models for gearsets of various levels. Use these gearsets to form a basic guideline on which pieces of gear that you will wear in each slot for each action. Each category features four tiers of gear, labeled Top, High, Mid, and Low. Additional instructions are provided underneath each subsection. A fully upgraded Tizona is an absolute behemoth. Recent buffs have escalated the damage to be relatively close to other general options, and the sword's Aftermath allows it to turn into an absurdly powerful weapon due to its increased TP generation and overall melee phase and weaponskill damage. The blade also sports plenty of utility thanks to its ability to restore the owner's MP with melee attacks and its vast offering of magic accuracy. Whenever maintaining AM3 is reasonable, Tizona will reign supreme over all other main hand options. Blue Mage has a unique advantage when it comes to that, too, in that you will have access to an array of spells that will supplement your damage or perform other tasks while waiting for Aftermath to wear off if you misstep in your timing. Almace has returned as the juggernaut it once was. A fully upgraded Almace is a force to be reckoned with. It gains the ability to deal triple damage fairly frequently with its aftermath. Having CDC as our primary WS also gives this sword the benefit of a convenient and very easy to maintain aftermath. Speaking of aftermath, the duration of each level has now also been doubled, making maintenance even easier. As if all of these bonuses weren’t enough, you’re also looking at an absolutely disgusting 50 additional DEX. This gives Almace the highest accuracy bonus of any sword we currently have, when you factor in the additional skill increase. In any situation where maintaining Tizona’s AM3 is not feasible, Almace is a colossus, surpassing everything else in its wake. It is also the absolute best offhand to a Tizona main. Our Aeonic weapon is an interesting one. With the ability to achieve “ultimate skillchains”, this weapon promises to work exceptionally well in tandem with our high base Skillchain Bonus trait. Unfortunately, BLU currently lacks powerful options for multi-stepping skillchains. This severely limits the overall usefulness of the sword. However, completely discounting skillchains, this is an excellent weapon. It boasts an exceptionally high base damage coupled with a ridiculously low delay, making it an excellent TP phase and WS item. Add onto this the additional STP and TP bonus, and you have a very powerful sword. The TP bonus does NOT activate in the offhand, so this sword will be replaced if you eventually pursue the almighty Tizona/Almace combo. Until then, though, it’s definitely a worthwhile goal. These swords are exceptional. Barring an RMEA, two Coladas with augments of +15-20 DMG, +10-15 DEX, +15-25 ACC/ATK, and +3-4 of either Crit rate, DA, or STP, are the absolute best weapons we can equip right now. Just know going into the augmenting system that you could luck out and build perfect ones in 20 stones or spend over a thousand on each. Highly debatable on whether or not the effort required is worth the reward, particularly with the exceptional RMEA options we have. Sporting an absurdly high base damage, massive amounts of accuracy and a bonus of 4 crit rate, this sword is a monster. With this as your mainhand and a Nibiru A in the off, you’re looking at some excellent accuracy and DPS potential. This combination will ultimately fall short of dual perfect Coladas or Tanmogayi +1/Colada, but you are able to avoid the random augment lottery and still maintain the second-best sword combination outside of RMEA weapons. Drops from Sarama, the ilvl 135 Unity version of Sarameya. With the right augments, this sword is one of our best mainhand weapons. +13-19DMG +10-15ATK +10-15ACC +4%DA in augments for a mainhand Claid puts it right near the top of the mainhand weapon hierarchy. This sword is a beast of a weapon. Path A sports a colossal 15 DEX and 27 accuracy, making it insanely beneficial in endgame events that require high levels of accuracy. Path B takes another route, providing a ridiculous 15 STR, 20 attack, and 3 Store TP. In situations in which you need the accuracy and do not have very well-augmented Coladas, a Tanmogayi +1 in the mainhand and a Nibiru A in the off is the best combination you can find. When you do not need the accuracy, substituting a path A for a path B will provide a substantial DPS boost. This sword is an interesting specimen. Yes, you read correctly; the sword comes with an absurd amount of MAB and macc, not to mention tons of STR and attack. What’s more is that it can also be augmented with up to 15 DMG, 10 STR, and 10 INT. While it seems exceptionally impressive, it will ultimately fall short of a path B Nibiru for accuracy-capped situations. However, it is one of the best weapons you can bring to the table for situations in which you’re casting magical nukes, and the best option for when Sanguine Blade will be your primary weaponskill. The additional effect is also quite interesting, and, with further testing, could make it a far better weapon than I currently give it credit for. The sword is also piercing rather than slashing, making it our best friend for fighting piercing-weak enemies. This sword was so close to being amazing. The base stats on it are superb, but none of the augment paths will provide the same benefits of a Nibiru Blade. This sword is excellent for casting physical spells, but given the difficulty in both obtaining and upgrading it, not to mention the increasingly fewer situations in which physical spells are useful, I do not recommend investing time into it. Even after all this time, Buramenk'ah is still a valid offhand option. It is definitely not the best you can use, but it will hold you over. Given the ease of obtaining this weapon, it is highly recommended to get one and use it until you are able to pick up your Nibiru Blades. These swords were once the best you could get, but the introduction of powerful new options has left them behind. They are by no means bad weapons, as both Path A and Path B have excellent augments, it's just that other options will win out. Still, if you do have these, they provide an excellent stopgap to your more powerful swords. It is just not recommended to go out of your way to build them. Anahera's more attractive cousin. The two of you exchanged glances at a social gathering and your heart went all a flutter at the thought of something magical. The sparkly new crit rate and dual wield seem great, and that increase in base damage sure is purtty. Unfortunately, much like its cousin, Deacon suffers the same problems as Anahera did before it. The absence of DEX and accuracy hurt the weapon too much to be considered for anything in endgame where those stats are more necessary than ever. And even for lower content, other options, such as Nibiru and others far more attainable will do the job better. Ah, young love. C'est la vie. Outside of looking cool, this sword has few practical applications. It is never the best mainhand option, and is only a decent offhand if you haven't got the easier to obtain Buramenk'ah. Its biggest saving grace is the fact that it has a unique magic damage bonus via its Magic Damage+ stat, which most swords don't come with and you'd normally need to resort to clubs to get. It works fine if you haven't got an Usonmunku or Buramenk'ah, but otherwise it isn't really worth using unless you're relying on magic damage for one thing or another. This weapon drops from Ark Angel Hume hard mode battles. Interesting weapon, this. It serves as quite a powerful sword, and it's remarkably easy to get, requiring only some time spent doing Eminence. When your TP is below 100 (this includes during a Weaponskill), you will unlock the latent that gives this sword a respectable D of 128 as well as imparting upon you a few more points of accuracy and attack. This is an excellent weapon to pick up for beginner BLUs looking to get started. Another easy to get option, acquired through Bayld from the Peacekeeper's Coalition once your server gains the Chimney for its building. It's nice to pair up with Eminent Scimitar, but doesn't replace it due to having less accuracy, higher delay, and one less point of base damage. Get this if you can't get anything better for your offhand. This is quite a solid sword if you're just starting out and looking for a good off-hand. When augmented with occasionally attacks twice and crit rate, it gets a serious boost in damage. However, the exceptionally low skill relegates it to low-tier content. As much as I hate this weapon, I will admit that the new augmented version is passable. It has a lot of accuracy and not much else. If all you want to do is hit something, it’s not a terrible choice. These sets can be confusing if taken only at face value. The sets labeled as "Top-tier" are the ideal sets for their respective role, therefore they work at their absolute optimal peak if used with every other piece of armor in that set. Sets High-tier, Mid-tier and Low-tier offer additional pieces of armor that can be used as substitutes for those in Top-tier. While you can wear all of the armor in High, Mid, and Low, I advise mixing and matching the best available pieces to you while staying inside the bounds of stat caps. In some cases, a piece of armor may be only slightly better than another while only performing a small amount of functions; in these cases, I advise that you take into consideration your inventory space and choose whether you want the optimal performance from a certain slot for a certain action, or if you want to conserve inventory space at a slight cost to performance. Also, take into consideration that the addition or subtraction of buffs, such as attack, accuracy, or haste from outside sources will play a large role in determining which pieces of gear are better than others. The absolute best way to tell what will work best for you is to download the BLU DPS spreadsheet yourself and test your equipment under different circumstances. Note that the link above does not allow for public editing. If you want to compare sets, you'll need to either download the sheet or import it into your own Google Drive and make a copy. Spell damage is currently not supported, only melee DPS, skillchains are currently not accounted for, and it lacks data on newer monsters. Other than that, this spreadsheet will accomplish the task of accurately simulating gear choices and DPS potential when used with proper thought and attention to detail. If you have any questions regarding lower end gear, augments, or other such queries, please ask in this thread. In general, all +1 items are interchangeable with their normal quality counterparts. For Gearswap Users: My BLU lua. I suggest using GearSwap over SpellCast if you use Windower 4.1, the features included will make a noticeable improvement to your gameplay. Furthermore, Spellcast is no longer officially supported by the Windower team. Oraen's BLU lua. This is just an updated version of Prothescar's, with some expanded sets and functionality. Notes concerning TP sets: ALL testing was conducted using the "Highest Tier DD Spec." Differentiating from this spellset will affect your gearing choices, so understand that. Regarding ALL gearsets: The HQ versions of abjuration gear have been specifically excluded from most sets, aside from the dream sets, in order to present a more attainable goal. In basically all situations, the HQ version of the item will overtake the NQ version. If you happen to have an HQ, feel free to replace the NQ version in any gearset with your higher quality one. *The absolute best TP set possible for Tizona. **Adhemar path B. Herculean needs 4 TA, extra DEX or STR/acc/atk is just a bonus. Samnuha max augments. ****Rosmerta’s 20 DEX, 30 acc, 20 atk, 10 STP. *A more well-rounded set that provides a good boost in accuracy with fairly minimal DPS loss. **Adhemar body and hands path A, head path B. Herculean needs 4 TA, extra DEX or STR/acc/atk is just a bonus. Samnuha max augments. ***Rosmerta’s 20 DEX, 30 acc, 20 atk, 10 STP. *The best TP set barring HQ abjuration gear for Tizona. **Adhemar hands path B. Herculean NEEDS 4 TA to be best in slot, while additional acc/atk escalates it further ahead. Samnuha max augments. ** Adhemar hands Path A. Herculean NEEDS 4 TA to be best in slot, while additional acc/atk escalates it further ahead. Samnuha and Dampening max augments. Tizona CDC set notes: Gearing remains basically identical to the CDC sets listed further in the guide. The only change from any set is that crit rate pulls ahead over triple attack, but both still fall short of crit damage. *Adhemar path A for accuracy or B for attack. **Herculean needs 4 TA, additional stats are a bonus. *Adhemar is augmented along Path A or B. A will have the best accuracy, but B provides the most attack. **All Herculean MUST have a minimum of 4TA to be best in slot. Additional acc/atk and DEX or STR only improves upon the items. ***Samnuha Tights assume max augments. *Adhemar path A for accuracy needs, B for attack. *Taeon need 2 TA to win. **Taeon need 2 TA to win. *This set is NOT intended to be used as a whole. It simply lists the strongest accuracy swaps in each slot. **Adhemar augmented along path A. NQ body can replace the HQ, but DEX/acc Herculean hands can beat NQ Adhemar Wristbands. ***Carmine path B provides the absolute most accuracy, but path D on both items serves a greater overall purpose for the job. ****Herculean need as much DEX and accuracy as you can get. These sets all work with their pieces of gear acting independently, for the most part. Each set contains the strongest to least strongest piece of gear for each slot, strongest being in set Top-tier and least strong being in set Low-tier. Changing a higher tier piece of gear to one of the lower tier ones will not be dependent on any other pieces of gear in the set. A note concerning WS sets: All Rosmerta’s Capes are augmented with 30 DEX, 20 acc/atk, and 10 crit rate. No other back option can truly compare to a fully augmented Rosmerta’s, so I highly suggest you build this ASAP. At low pDif values, floestone will perform better. **Herculean augmented with 15 DEX, 20+ acc/atk, 4 crit damage. *Adhemar augmented along path B. **Light Gorget and Light Belt are also applicable. *** Herculean augmented with 10+ DEX, 20+ acc/atk, 4 crit damage, ideally. **** Herculean Gloves NEED 10+ DEX, 3+ crit damage/rate/TA to be superior to adhemar wristbands. Even then, based on your STP values in your STP set, Adhemar may produce overall superior DPS, even though the average damage of CDC may be lower. * Adhemar augmented along path A for accuracy or B for attack. **Herculean items augmented with DEX and Crit damage in order to be superior to other options. ***Taeon augmented with STR/DEX and either crit rate or TA. *Adhemar augmented along path A for accuracy or B for attack. **Rawhide pieces along path A. ***Reign items assume max augments. ****Taeon augmented with STR/DEX and either crit rate or TA. *This set is not intended to be used as a whole. These are simply the best accuracy pieces in each slot. If you need accuracy, swap piece by piece until you reach cap. A note concerning Taeon: At low attack ratios, critical rate/critical damage augments will win out over TA for CDC. As your attack rises, TA begins to pull ahead. Both sets are very similar in performance overall, and as TA is generally superior during a TP phase, I would recommend focusing on that set first. *Carmine augmented along path B. **Telchine with double attack, acc/atk and STR/MND augments. * All Herculean augmented with 15 STR and 4 WSD or 10 STR and 5 WSD. More accuracy and attack the better. ** Rawhide feet path D.
***For Expiacion, jhakri pigaches +2 are superior to Rawhide. ****Reign items assume max augments. **Herculean NEED 10+ STR and 4 crit damage to win. *** Samnuha assumes max augments. These sets work similar to the weaponskill sets. Replacing one piece of gear will not require others to be replaced along with it to gain the full benefit. Physical spell sets are general use sets; optimizations can be made in order to maximize the damage of certain spells; swapping in Spiral Ring for STR/VIT and STR/INT spells is a good example. For all physical spells, assimilator's charuqs +3 are best in slot if Chain Affinity is active. *Herculean augmented with STR and acc/att. You need high values to make them best-in-slot. **kuwunga earring is best when latent is active. I do not recommend Jhakri pieces as primary nuking options because of the massive detriment to your spell recasts. There are situations in which your recast does not matter, but for situations where it does, that large hit to your sustained damage (~50% increased recast) is a huge deterring factor. Another issue with the set is the large hit to defenses, and since you're usually cleaving on BLU, that can easily become a problem. Using Jhakri for nukes is fine, but you need to understand the drawbacks of the set. *Amalric body and legs Path A. Hands and feet Path D.
**Herculean augmented with as much INT and macc/MAB as possible. **Herculean augmented with INT and macc/MAB. *Helios has either pure MAB augments or Macc/MAB, as well as INT. *Helios and Hagondes both augmented with MAB. **Hagondes are fine as base, but perform better and better as you have higher MAB augments. **Hagondes and Telchine both need some MAB. *This set is not intended to be used as a whole. It simply lists some of the best macc pieces for each individual slot. Mix and match as best suits you. *Telchine augmented with a total of +11% cure potency received. This allows you to exactly hit the 30% cure potency received cap. If you find yourself using waltzes consistently, asklepian ring is also a solid choice, but take into consideration that you will need 2% more cure potency received from Telchine in order to cap. As of the past few months, BLU has received a ridiculous amount of options for cure potency. There are many choices available to you, and you should feel free to choose the ones most readily available. Your primary goals are to hit the 50% cure potency cap, hit the 30% cure potency received cap when using self-cures, and to then stack all the MND you can get your hands on. *Telchine Gloves with 50 HP and 8 cure potency, Medium's Sabots with 5 cure potency, and Despair Mail Path A. *Slightly modified White Wind set for when you need a higher cure for yourself and a weaker cure for your group. **Telchine Gloves with 50 HP and 8 cure potency, Medium's Sabots with 5 cure potency, and Despair Mail Path A. *Amalric head path D, body path A. **Psycloth lappas augmented along path D.
*Used for spells such as Sudden Lunge, Tourbillion, and any physical spells with an additional effect. *****Weigh your accuracy and magic accuracy needs. If you find yourself landing the physical part but not the magical, add additional macc, and vice versa. *This is my personal hybrid set. I sacrifice a little bit of offense for a good bump in defense. There may be situations where you need more or less defense, so it's your judgment call on how to adjust accordingly. Everybody has their own idea of the optimal balance between offense and defense, so fit your set to your personal preference. **Adhemar head path D, hands path B. *This set is simply for completely idle situations. PDT swaps can be made as necessary. carmine cuisses +1 or Shneddick ring for movement speed. *An actually attainable idle set. This set is simply for completely idle situations. PDT swaps can be made as necessary. carmine cuisses +1 or Shneddick ring for movement speed. *All Herculean augmented with -4DT. This set overcaps you on PDT, so mix and match as you see fit. *Once you reach the cap of -50% Magic Damage Taken, then put Magic Defense Bonus or magic evasion in remaining slots. **All Herculean augmented with -4DT. *** This set will overcap you on MDT, especially with shell V, so take that into consideration. *Taeon augmented with +5 FC. **When casting Blue Magic, changing your body armor to hashishin mintan +1 is superior. ***This set gives you 72% FC. Depending on your FC trait, you are almost certainly overcapped. With FC3 (from Erratic Flutter and JTB2), you can remove 7% FC from this set and remain capped. ****While Carmine Mask +1 provides the highest FC total in its slot, I suggest building a Herculean Helm with 6% extra FC to save some money. Support jobs are a point of contention for just about any job. Luckily, BLU is pretty cut and dry. In this section, I’ll outline which sub jobs you will need and when you should use them. /WAR: You will use this subjob most often if you play in groups. /WAR offers the most offensive “bang for your buck” out of any other subjob, allowing you to set powerful DD traits like Dual Wield III, Store TP, and Triple Attack while gaining Double Attack, Attack Bonus, Berserk, Aggressor, and Warcry. This will be your go-to sub for any situation where maximum physical damage is your main focus, greatly affecting the damage output of your swords. /RDM: This subjob is more suited for solo play, however in the situations where you’re aiming for magical damage it is also a good choice. /RDM offers a selection of defensive buffs as well as Magic Attack Bonus II and Fast Cast II which can all be useful while soloing or providing a lot of support in a group. /RUN: A new subjob added with Seekers of Adoulin, it mixes defensive and offensive benefits into one package. Using Runes, Wards, and Effusions, you can gain a pretty nice chunk of magic defense and additional magic damage via potent enspells and Lunge. You also gain 7% parry rate and a 9% chance to resist all status ailments via Inquartata and Tenacity traits as well as some bonus magic defense and regen. You'll also gain a little TP for every parry thanks to Tactical Parry. You'll also gain access to Swordplay, a very powerful ability that greatly enhances your Accuracy and Evasion. Overall, a very solid subjob choice. /NIN: While this used to be the subjob of choice for just about any situation, it’s tapered off into a very niche department. /NIN is only really useful when you’re soloing hard-hitting targets that your evasion and magic won’t be able to withstand, or for lowman tanking the same types of targets. You gain a free Dual Wield III and Utsusemi as well as a relatively cheap alternative to Silent Oils and Prism Powders via Monomi and Tonko. /DNC: This one is for Dynamis only. It provides rapid JA procs, a free if unreliable Sneak and Invisible, and a free Evasion Bonus and Skillchain Bonus trait. /SCH: This is the go-to sub job for main healing, and in rare cases solo play. You won't be healing very often, however you gain status removal spells and some additional support spells through Addendum: White in addition to a boost in cure potency and MP efficiency via Light Arts. Hopefully this guide has been educational for you, and I’ve helped you on your way to becoming a successful BLU. I basically stole the idea from Sylow and his awesome DNC guide, so thanks buddy <3. Any questions, comments, or concerns may be left below or sent to me via PM. I’ll update this with information that I find relevant to the guide as time goes on. MAY THE BLUE BE WIFF YOU, DAWG.